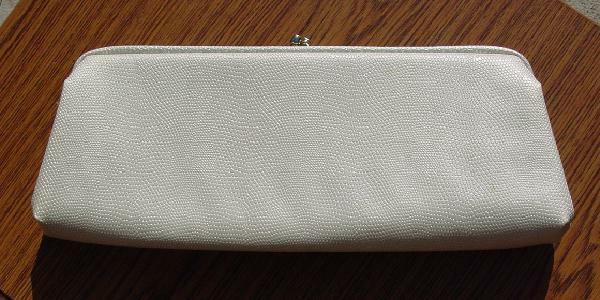 This vintage '60s textured reptile pattern clutch is in a celery color. It has a gold-tone opening rim and a bypass closure. There is a light blue pen mark (3/8" long) 1 1/4" from the top and 2 1/2" from the right side, which is hard to see in daylight. There is some tarnish to the gold-tone rim. 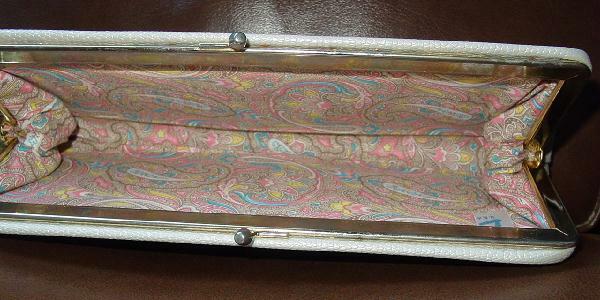 It has a beige, white, aqua, pastel pink, yellow, and white paisley lining. It goes with any color. It's from a New York stylist's collection, and was used for pictures for models' portfolios.